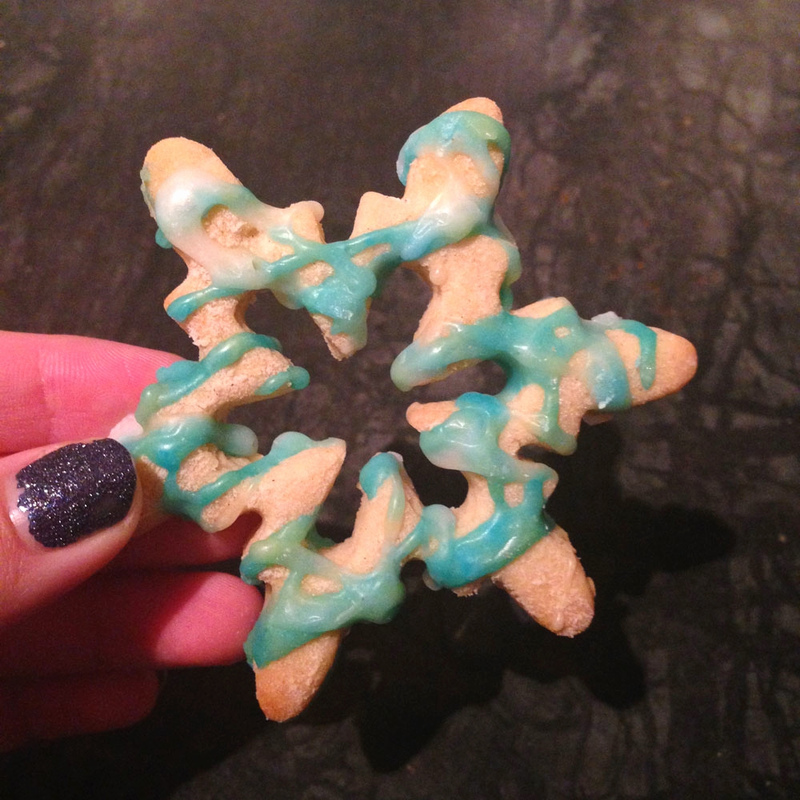 At the weekend I made a whole bunch of pretty amazing Christmas snowflake cookies (if I do say so myself), so I thought it was only fair that I share them with you so you can make them too! The recipe is take from a book called Christmas Cookies that I picked up last year at a garden centre. So here is the recipe for your baking pleasure! You can use any cookie cutters, but I think these cute snowflake ones from Lakeland are particularly adorable. 1 – Sift together the flour, baking powder and salt together in a bowl. In a separate bowl, cream the butter and the caster sugar together until light and fluffy. Beat in the egg, 2 tsp vanilla extract and milk until smooth and then mix in the flour mixture to form a soft dough. Cover the dough with clingfilm and chill in the refrigerator for 30 minutes. 2 – Grease a couple of baking sheets. Preheat the oven to 180c/350F/Gas Mark 4. Roll out the chilled dough on a lightly floured surface to 5mm thick. Use your cookie cutters to cut out all your cookie shapes from the dough. Transfer the cookies to the prepared baking sheets. Bake the cookies in the preheated oven for 10 minutes until golden brown. Remove from the oven and allow to cool for 5 minutes before transferring to a wire rack to cool completely. 3 – Once the cookies have completely cooled, mix the icing sugar with a bit of warm water until it is at a dripping consistency. I haven’t specified an exact amount of icing sugar to use because this will depend on how much icing you want to use on your cookies. Just use a bit of guesstimation to decide how much you will need, you can always make more if needs be. Once the consistency is correct then add a bit of the blue food colouring until it is the desired shade. 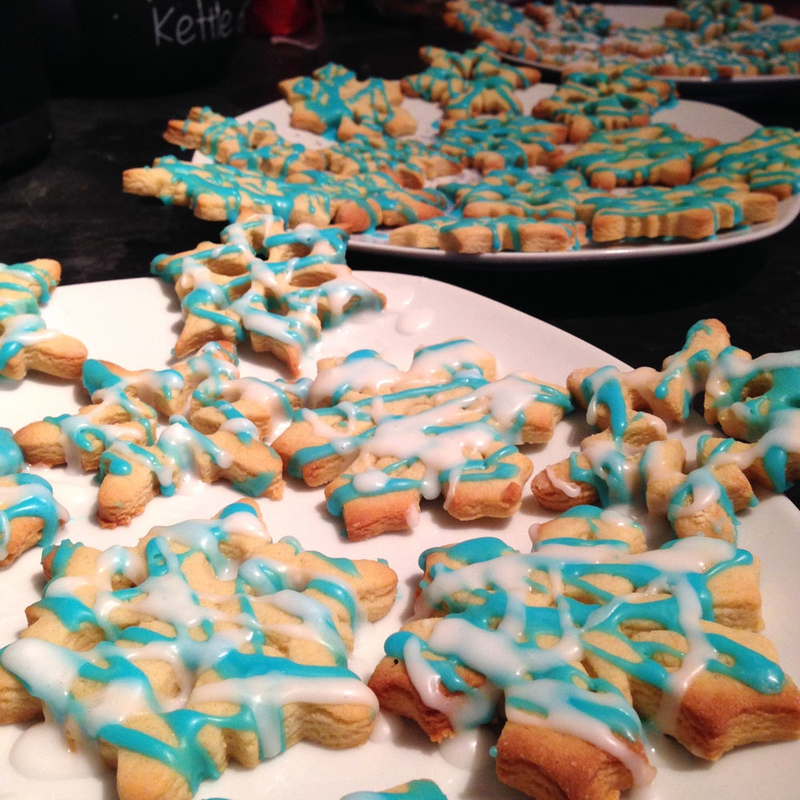 Then using a spoon, drip the icing back and forth across the cookies until you have a lightly covered striped effect. You can then either leave the cookies with just one colour icing, or make up some more and add a bit of white icing in a second layer like I did in the top picture on some of the cookies. Its totally up to you! Around 35 of the tasty little treats haven’t even lasted 4 days in my house, so I’m definitely going to be whipping up some more this weekend! Let me know if you decide to make them too!